Tourette syndrome (TS) is a neurological disorder that was first diagnosed and described by the French neurologist Dr George Gilles de la Tourette in 1825, though several historical figures are now thought to have been sufferers before then, including Samuel Johnson and Mozart. Tourette syndrome is characterised by the occurrence of a combination of involuntary physical (motor) and vocal tics (not necessarily simultaneously), nearly every day or intermittently over the course of a year. It tends to develop before the age of 21, and most often around the age of 7. The condition is not life threatening, and is very often so mild that it does not require treatment. It may become worse through adolescence, and sometimes improves with age. Common examples of motor tics include eye twitching/blinking, facial grimacing, head jerking, shoulder shrugging, jumping, kicking, finger movements, jaw snapping, tooth clicking, frowning and touching people. Vocal tics include throat clearing, hissing, yelping, sniffing, grunting, tongue clicking, uttering words or phrases inappropriately (echoing others, or blurting out obscene words), repeating the same phrase several times. People with TS often have an IQ equal to their peers. However, the condition is often associated with other behavioural and neurological problems, such as obsessions, compulsive behaviour, autism, hyperactivity and ADHD, impulse control difficulty, sleep disorders, anxiety, depression, restless leg syndrome, heightened sensitivity to sensory stimuli and learning difficulties. It is thought that tics are caused by the abnormal metabolising of certain brain neurotransmitters, including dopamine and serotonin, which results in inappropriate signals being sent from the brain. Neurotransmitters are natural chemicals that carry a signal from one nerve cell to another at specific spots called receptors. Research indicates that tics are related to dopamine receptors which are supersensitive to dopamine in the basal ganglia the area of the brain involved with movement control and activity. Other studies suggest that tics may be caused by higher than normal levels of dopamine production and use. Some researchers also claim that TS patients have low levels of serotonin, which has been linked with some of the symptoms of TS including obsessive compulsive disorder (OCD), depression and sleep disturbances. There is almost certainly some genetic influence on the development of Tourette syndrome it is observed to run in families (an individual with TS has a 50% chance of passing the predisposition on to each child); however, there is growing evidence that environmental and dietary factors can play a significant part in aggravating the symptoms. In fact, some diagnosed sufferers claim that they do not actually have Tourette syndrome, but a collection of allergies which mimic the symptoms of TS. Since diagnosis is made by observation, and the elimination of other possible conditions such as Sydenham's Chorea, this cannot be ruled out. Although there is no comprehensive cure for TS there are many approaches to controlling the symptoms. Different medications are used to target specific symptoms associated with TS. This makes the drugs more effective to treat one symptom but can result sometimes in exacerbating the other symptoms. They counteract dopamine over-activity by blocking dopamine receptors. Side effects: Patients need to be monitored carefully, there is a risk that they may develop an involuntary movement disorder called tardive dyskinesia. Other side effects include drooling, contraction of the facial and neck muscles, slow movement (bradykinesia), restlessness, tremors, fatigue, depression, anxiety, weight gain, irritability, dizziness, headaches, and insomnia. Tiny amounts of this chemical poison, which comes from the bacterium Clostridium Botulinum, were found to temporarily paralyse muscles and nerves. BTX has therefore been used as a treatment option for cerebral palsy and dystonia. In Tourette, it is injected into the muscles involved in tics. These drugs increase the concentration of serotonin within the central nervous system and enhance serotonin's neurotransmission activities. Side effects: Drowsiness, blurred vision and nausea. Side effects: They may increase tics, cause tremors and reduce appetite. This technique helps people deal with their habits through awareness and new patterns of behaviours. Sometimes a mirror is used. Individuals learn a new and opposite response to a usual behaviour such as motor or verbal tics. For instance patients who usually blurt out obscene words learn to substitute these words for a more acceptable one. For head jerking back they are taught to contract the neck flexors and keep their chin slightly down and in. This technique is used in the treatment of OCD. It is beloved that compulsions are created because they provide temporary relief from obsessions and anxiety. Situations or objects that trigger obsessions and compulsions are first identified by the therapist. They are then presented to the patient who is prevented from reacting with the usual compulsive behaviours until he/she become habituated to the obsessions and dismiss them. Many people who have identified particular allergens that trigger their tics claim that contact with the substance explains the 'mysterious waxing and waning' of the symptoms which many conventional doctors accept as part of the nature of the condition. Allergens may be natural or artificial chemicals in food or in the environment. They may be identified by means of blood tests, or by eliminating them and observing any changes. People can react in very different ways to certain substances - two individuals who are allergic to the same substance may express this allergy in quite different ways; it has been suggested that some people have 'target organs' that are affected by environmental exposure: this could be the lungs (asthma), the skin or the joints for example while those with neurological allergies may develop ticcing. Other possible allergens include: pesticides, sodium nitrate, nightshade foods (tomatoes, potatoes, peppers, aubergine), Sudafed. - It is also believed that a deficiency in phenol sulfur-transferaes (PST), an essential enzyme that breaks down products of foods, hormones and chemicals no longer needed, may create a build up of the neurotransmitter dopamine. In 1998 Rosemary Waring from the School of Biochemistry at the University of Birmingham showed that salicylates, natural chemicals found in fruits, vegetables, plants, nuts and aspirin, can suppress the production of PST. - According to Stephen Edelson* food, chemical and environmental allergens may trigger a release of serotonin which causes decreased blood flow in the basal ganglia (see page 1) thus resulting in tics. - Dr Doris Rapp, a paediatric allergist, has written several articles and books on allergies and behavioural problems. For more information visit her website at: http://www.drrapp.com/. For more information on allergies ask for our fact sheets on allergies, the Feingold food programme, candida, gluten and casein allergies. 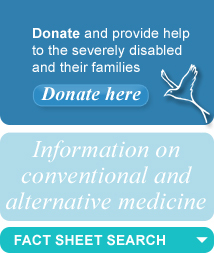 A nonprofit organisation dedicated to exploring advanced and complementary treatments for neurological conditions. B-Complex vitamins: Vitamin B3 (niacin), B6, folic acid, inositol, choline and B12. They act like natural tranquilisers on the nervous system. Magnesium plays an essential role in the nervous system and promotes muscle action as well as proper absorption of vitamins B, C and E.
Pycnogenol: It regulates enzymes that help control dopamine. Tryptophan: This amino acid is essential for the production of vitamin B3 which is vital for the brain to manufacture serotonin. Tryptophan is naturally found in bananas, beans, brewer's yeast, brown rice, soy, cottage cheese, dairy products, dates, eggs, nuts, peanuts, seeds, seafood, fish, and turkey. Its synthetic form has been banned in several countries for safety reasons. See our fact sheets on magnesium, pycnogenol and evening primrose oil. Grimaldi BL. The central role of magnesium deficiency in Tourette's syndrome: causal relationships between magnesium deficiency, altered biochemical pathways and symptoms relating to Tourette's syndrome and several reported comorbid conditions.Med Hypotheses 2002 Jan;58(1):47-60. *Please note this is a commercial company. 1 The principle of similars or that "like cures like": homeopathic remedies treat illnesses with a substance that produces, in a healthy person, similar symptoms to those displayed by the person who is ill, for example Allium Cepia, a remedy created from red onion, is used to treat patients whose symptoms include watery eyes and a runny nose. 2 The principle of infinitesimal dose: Homeopathy works the opposite way of conventional medicine where a minimum dose is required for effect. the more a remedy is diluted the more potent it becomes, the more specific its effects are and the longer they last. It is believed that homeopathic remedies are diluted to such a degree that no atom of the original substance is left in the final remedy, how the remedies work is not well understood hence the scepticism of many physicians. Homeopaths believe the answer is to be found in the domain of quantum physics, the water and alcohol mixture remember that the substance was once there. They claim that continued dilution and shaking or "succussion" can imprint the electromagnetic signal of a substance in the water. 3 The principle of specificity of the individual: The treatments are individualised: each individual has a symptom profile and it is likely that two individuals with the same condition will be given different medicines. Practitioners look at the whole person not just the condition. They will ask a series of questions about the medical history, moods, likes and dislikes, diet, chronic disorders or traumas of the patient in order to draw a list of symptoms, they pay special attention to unusual symptoms. The choice of remedies depends more on the patient's individual reaction to illness, mentally and emotionally, than on the signs and symptoms characteristic of the disease. The remedy that fits all the symptoms of a person is called "similimum" for that person. There are over 2000 homeopathic remedies. They are made from plants, minerals, metals or animals. Their Latin name indicates the substance they were created from. The remedies are extremely pure, they come in the form of lactose tablets, powder, granules, or as a liquid. Parts of the original substance are dissolved in alcohol to create the mother tincture (MT). This liquid is shaken ("succussed") several times, 1 drop is mixed with various ratios of distilled water: 1 in 10 (x dilutions), or 1 in 100 (c dilutions). For example 2C (2CH in Europe) dilution means that 1 part of mother tincture is mixed with 99 parts of water and alcohol, then shaken (1C), then 1 part of this liquid is mixed with another 99 parts and shaken (2C). Remedies should be taken at least half an hour before or after taking food or drink. Avoid strong-tasting substances such as peppermint (toothpaste that doesnt contain mint is available at health food stores), eucalyptus, camomile, camphor, coffee and tobacco. Granules or tablets should be dissolved under the tongue for best results and it is advised not to touch them with fingers otherwise they will lose their properties. Long-standing complaints are believed to take longer to treat. Symptoms may often get worse before they begin to get better, this reaction is called "the healing crisis". There are a number of basic principles behind the administering of herbs to treat illness: One is that people are treated, not the symptoms. This means that it is hard to say which of a number of possible herbs will be most effective on an individuals symptom, without a full understanding of the individuals physiological and psychological make-up and general state of health. It is a holistic treatment, and the cause of the symptoms must be addressed for it to be most effective. For example, St Johns Wort is now fairly well recognised as a useful anti-depressant; however, it is only effective on the type of person who needs their nervous system calmed, whereas some depressives need their nervous system stimulated. Another, related, principle is that the body heals itself - herbs are prescribed not to artificially introduce an action into the system, as is the case with conventional medicine, but rather to restore balance in the body. Different herbs stimulate or suppress the action of different systems in the body. Further, 'herbal synergy' is important - this is the idea that the different natural chemicals that are found in a single plant all work together in the body. It is thought to explain why the chemicals, when extracted and used in isolation may have side effects, which do not occur if the whole plant is taken. Before a herb, or most often a combination of herbs, can be prescribed the practitioner will first assess the patient's condition by means of verbal and physical examination. It is particularly important to ascertain whether the body is predominantly hot or cold, as indicated by blood heat. Heat is symptomatic of over-activity in the functions of organs, and coldness, under-activity. It is also important to learn whether the body is damp (as indicated by clamminess and urine flow) or dry. Many herbal preparations are available over-the-counter from health food shops and pharmacies. It is important to choose good suppliers, and to follow the instructions on the label. It is also possible to prepare simple herbal teas: however herbalism is holistic and does not treat symptoms in isolation. For this reason, it is often best to seek professional advice. 200-300 different herbs are used by Western herbalists. The petals, seeds, leaves, flowers, roots, berries and internal gel of plants are all used medicinally - the different parts of the same plant can have quite different properties. They tend to be dried, but may also be used fresh. decoctions - tough parts of the plant are boiled in water; the liquid containing the active ingredients is then strained. tinctures - the herb is soaked in alcohol and water for two weeks, then strained in a muslin-lined wine press. infusions - the herbs are covered with very hot water and left to steep for ten minutes. The resulting liquid is much like a tea, and may be sweetened with honey. infused oils - used for massage, these oils may be made by placing the herbs and oil over heat, or they may just be left in sunlight. creams - oil, water, glycerine and herbs are simmered for several hours, before being strained and left to set. ointments - oil and herbs are combined over heat, then strained and left to set. These are particularly useful for when the skin needs to be protected from moisture. Well-prescribed and well-prepared herbal remedies are usually free from unpleasant side-effects, after-effects and allergic reactions. However, excessive intake of beneficial herbal remedies can be toxic. If you are taking any conventional medicines, seek advice from a herbalist to avoid herb/drug interactions. For example, ginseng may react with the anti-depressant phenelzine. Do not discontinue medication without consulting your doctor. Never buy herbal products by mail order - you have no guarantee that they are safe. Essential oils, extracted from the roots, flowers, fruits, leaves and stalks of plants and certain trees, are absorbed in the body by inhalation and through the skin. The scents released in aromatherapy stimulate the hypothalamus, the area of the brain influencing the body's hormone system. It is thought that mood, metabolism and stress levels can be affected by smell. It is not well understood how the oil molecules actually enter the bloodstream, but the psychological effects have been well studied. Some essential oils are believed to be uplifting while others have a relaxing and calming effect. A range of oils is used in treatment (some are not appropriate in pregnancy, for young children or for certain conditions). Trained aromatherapists use high-quality, natural oils diluted in a "'carrier" oil or blended into a cream. Lower dilutions are used for sensitive skin and in pregnancy. Practitioners should only use oils that are organic and bought from reputable companies. Aromatherapy massage techniques are based on Swedish massage which aims to relieve tension in the body and to improve circulation as well as stimulating the lymphatic system to assist removal of metabolic wastes from the body. The patient may also be asked to use certain oils under the supervision of the practitioner in inhalations: adding a few drops on a handkerchief or in a bowl of hot water, or by using compresses and baths. Light bulb, candle lit or electric diffusers are also popular and relatively safe. Cautions: Essential oils should not be used neat on the skin or applied near the eyes. Although aromatherapy can be beneficial during pregnancy the following oils should not be used by pregnant women: German camomile, clary sage, rosemary, basil, peppermint, cedarwood, cypress, juniper, hyssop, myrrh, nutmeg, origanum, fennel, pennyroyal, marjoram, cinnamon, and clove. Rosemary, hyssop, sweet fennel, sage and wormwood should also be avoided by epileptics while peppermint and thyme must not be given to small children. Peppermint and camomile block the therapeutic effects of homeopathy, these oils should be used at least half an hour before taking homeopathy. Acupuncture consists of the insertion of one or several small metal needles into the skin and underlying tissues at precise points on the body as a treatment for various disorders. Acupuncture is only one element of traditional Chinese medicine, which also includes herbs, acupressure, exercise and diet. Acupuncture grew out of ancient Chinese philosophy of the yin and the yang. The forces of yin and yang are thought to act in the human body as they do throughout the natural universe as a whole. Disease or physical disharmony is caused by an imbalance or dominance of one of these two forces in the body, and the goal of Chinese medicine is to bring the yin and the yang back into balance with each other, thus restoring health. An imbalance of yin and yang is thought to obstruct the vital life force, or the chi, in the body. The fundamental energy of the chi flows through 14 main meridians, or pathways, in the body, each in turn is associated with a major organ (liver, kidney, etc.) or body function. Acupuncture aims to affect the distribution of yin and yang in these channels so that the chi can flow freely and harmoniously. Disruption on a meridian can create illness at other points along it; for example, a disorder of the stomach meridian could be manifested as pain in the gums. The actual practice of acupuncture consists of inserting needles into any of hundreds of points located over the 12 basic meridians and over a number of specialised meridians. Once inserted, a needle may be twisted, twirled, or connected to a low-voltage alternating current. The stimulation of acupuncture selectively acts on impulse transmission to the central nervous system, thus closing certain neurological "gates" and blocking the transmission of impulses from other parts of the body. The practitioner often inserts needles at a considerable distance from the point on which they are to act; for example, a needle inserted into the pad of the thumb is used to produce analgesia in the abdomen. Similarly, successive points on a specific meridian may affect widely different areas or conditions. Other acupuncture techniques include moxibustion in which the herb moxa is burnt to create heat to stimulate the acupoints. In cupping, glass cups may be placed over the points in order to draw blood towards them. Electro-acupuncture was developed in China in the 1950s. A low-intensity pulsing electric current is applied to the needles to stimulate the acupoints and can reach a number of acupoints simultaneously. Laser acupuncture directs a fine, low-energy laser beam on to the acupoint - particularly useful for patients with an aversion to needles. Chinese researchers Wu, Li and Kang claim that out of 156 cases of Tourette syndrome, 92.3% were effectively treated by acupuncture. (J Tradit Chin Med 1996 Sep;16(3):211-3). Always see a qualified practitioner. Acupuncture is an invasive therapy and therefore not without risk. Ensure needles used are sterilised or preferably that new disposable needles are used each time. Researchers believe that there are many cannabinoid and nicotine receptors in the brain. When these two substances are absorbed in the body they bind to the receptors and inhibit the release of dopamine. Neuroleptics block the release of dopamine which results in a decrease of tics (see page 2) but conversely researchers found that low levels of dopamine were causing tremors, shaking and sedation. Sanberg studied the effect of nicotine patches on children with TS who were taking medication and discovered that nicotine enhanced the therapeutic properties of neuroleptics without causing the above side effects. (Sanberg PR, Silver AA, Shytle RD. Nicotine for the treatment of Tourettes syndrome. Pharmacol Ther 1997;74(1):21-5). Although no evidence was found to show that these children became dependent on nicotine, signs of nausea and dizziness were reported. Researchers are currently looking into possible nicotine substitutes that would eradicate these side effects. - Tizabi Y, Russell LT, Johnson M, Darmani NA. Nicotine attenuates DOI-induced head-twitch response in mice implications for Tourette syndrome. Prog Neuropsychopharmacol Biol Psychiatry. 2001 Oct;25(7):1445-57..
- Gaynor CM, Handley SL Effects of nicotine on head-shakes and tryptophan metabolites.Psychopharmacology. Psychopharmacology (Berl). 2001 Jan;153(3):327-33. - Silver AA, Shytle RD, Philipp MK, Wilkinson BJ, McConville B, Sanberg PR. Transdermal nicotine and haloperidol in Tourette's disorder: a double-blind placebo-controlled study. J Clin Psychiatry 2001 Sep; 62(9): 707-14. - Elazar Z, Paz M Potentiation of haloperidol catalepsy by microinjections of nicotine into the striatum or pons in rats. Life Sci.1999; 64(13): 117-25. Cautions: medication containing nicotine is not yet available. Do not use nicotine products on children. It is still not clear how cannabis can reduce tics but it has been suggested that cannabinoid receptors may interact with dopamine receptors. Studies conducted by Dr Muller-Vahl showed that the action of one of the main active chemical compounds in cannabis, Delta(9)-THC, can reduce tics. - Muller-Vahl KR, Schneider U, Koblenz A Treatment of Tourette's Syndrome with Delta9-Tetrahydrocannabinol (THC): A Randomized Crossover Trial. Pharmacopsychiatry 2002 Mar;35(2):57-61. - Muller-Vahl KR, Kolbe H, Schneider U, Emrich HM. Cannabis in movement disorders. Forsch Komplementarmed 1999 Oct;6 Suppl 3:23-7. - Muller-Vahl KR, Kolbe H, Schneider U, Emrich HM. Cannabinoids: possible role in patho-physiology and therapy of Gilles de la Tourette syndrome. Acta Psychiatr Scand 1998 Dec;98(6):502-6. - Muller-Vahl KR, Kolbe H, Dengler R.[Gilles de la Tourette syndrome. Effect of nicotine, alcohol and marihuana on clinical symptoms] Nervenarzt 1997 Dec;68(12):985. Caution: cannabis is an illegal substance in most countries. With this method, alternative patterns of movement are explored. The aim is to enhance easy movement by creating minimum effort for maximum efficiency. Physical movement is used to re-educate the brain. "Awareness through movement" is usually taught in a group, Feldenkrais practitioners see themselves as teachers, they make their students aware of how they carry out movements out of habit, and then they work on re-training them to use a proper sequence of movements by giving them verbal directions. During each session movements are organised around a theme. In "functional Integration" sessions take place on a one-on-one basis and are custom-tailored. The therapist uses slow and gentle touch on the client who lies on a padded table fully clothed. The therapist feeds back information to the client who in turn is asked to make the changes. According to Feldenkrais there is a strong connection between the body and the mind, for instance bad posture reflects the state of the nervous system, based on this idea individuals can subconsciously answer to movement and touch. It is believed that stress can trigger tics. Relaxation techniques can reduce stress and help individuals to better control their mind. - Michultka DM, Blanchard EB, Rosenblum EL. Stress management and Gilles de la Tourette's syndrome. Biofeedback Self Regul 1989 Jun;14(2):115-23. "The present study examined relaxation training and desensitization training as a method of reducing the frequency and intensity of tics and the distress they caused in a young adult diagnosed with Tourette's syndrome. Inspection of data suggests that both components of stress management added to total treatment efficacy." Based on the principle that the mind is intrinsically linked to the body and that our emotions affect our body, biofeedback teaches patients how to be aware of physiological functions that are normally automatic and unconscious and how to use this internal information to improve their health. Using measuring devices patients learn how to monitor their body responses (heart beat, skin temperature, blood pressure, respiratory patterns, brain wave activity or muscle tension) in order to control them. Neurotherapy used in neurofeedback, is an advanced form of biofeedback. Neurotherapy means increasing moments of heightened alertness. It uses a specialised brain scan to observe the brain waves of children with ADD/ADHD. These children show brain waves which are smaller and/or slower than normal psychological reactions to brain stimuli. For ADD children medication with amphetamines is believed to stimulate the brain enough for them to focus and pay attention. Hyperactivity is believed to be a coping mechanism to maintain normal arousal. When hyperactive children are first able to sit still, they rapidly go into a drowsy state. The child has metal discs placed on the scalp that pick up electrical signals from the brain (a simple and painless procedure). An attached computer analyses the brain waves and by means of sounds and changing screen displays, lets the child know when they are producing patterns consistent with alertness. These periods of activation are then reinforced with exercises. With this aid the child can learn self-control. Initially the increases in alertness are small and fleeting, but through practice and encouragement, greater improvements can be seen. The average length of neurotherapy treatment is 50 sessions. Though benefits can be noticed after about 10 sessions, it is recommended that treatment be continued in order to solidify skills learned. Two sessions per week are normal. The 50 sessions include a weaning off period, aimed at maximising the likelihood that the benefits of neurotherapy will last beyond the sessions. A study by Tansey showed that biofeedback may be a successful treatment to reduce tics because it increases voluntary muscle control (A simple and a complex tic (Gilles de la Tourette's syndrome): their response to EEG sensorimotor rhythm biofeedback training. Int J Psychophysiol 1986 Jul;4(2):91-7). Neuro-linguistic programming is a form of psychotherapy that was devised in the 1970s by linguist John Grinder and therapist Richard Bandler. The main principle is that our life experiences programme the way we see the world and ourselves, and the way we communicate with others. The way we think is revealed not only by our choice of words, but through our body language and eye movements and even subtle changes in skin colour/perspiration. The therapist draws the patients attention to any unconscious thought patterns that may be having a detrimental effect on the patients overall mental and even physical well-being, and attempts to 're-programme' their responses to the situation. Neuro-linguistic programming has applications in the general contexts of sport, business, sales and education, as it can be a powerful tool in fostering self-confidence and effective communication. However, as a form of therapy, the focus tends to be the patients attitude towards their illness. For example, a neuro-linguistic therapist would interpret someone who views themselves as 'an asthmatic', rather than 'a person with asthma', as having let the condition take over. Negative patterns of thought are modified, so that the patient feels less limited by their illness, and their body's natural healing systems can be more effective; it is thought that the immune system may be stimulated by such a process. Although neuro-linguistic programming is related to hypnotherapy, the practitioner does not usually induce a trance state in the patient. The patient and therapist will discuss the desired outcome of the therapy at each session, and what the patient feels they are doing to achieve it. The number of sessions required varies, but results are often seen after a relatively short period. Many self-help books and videos are available, but it is advisable to consult a practitioner at the first stage. The nature of the hypnotic trance is not as mysterious as some people think. It is a state that most of us naturally drift in and out of during the course of a day: when we become engrossed in a task or a film, when we drive home on 'automatic pilot', when daydreaming. The conscious mind has been likened to the tip of an iceberg, (with the unconscious underneath the surface, much larger, and very powerful), and to the ram power on a computer (which is only a fraction of the hard drives capacity). In physical terms, it is thought that the left, analytical side of the brain becomes less active, while the right, imaginative, emotional side becomes more active. During deep hypnosis the metabolism, breathing and heartbeat slow down, and the brain produces alpha-waves, which indicate deep relaxation and are also induced by meditation. Although the word derives from the Greek hypnos - 'sleep', the hypnotic state is quite different from sleep, and the patient will almost certainly remember the whole experience. The hypnotist encourages the patient to enter the trance-state, more or less deeply, but it is not possible for it to be imposed upon the patient. Further, patients cannot be encouraged to do anything they don't want to, as they are still in control and their conscious mind is protecting them from unreasonable suggestions. Hypnotherapy itself can take several different forms. The most usual form is 'suggestion hypnotherapy', which aims to break patterns of thought and behaviour by means of positive suggestions and imagery. Pain can also be managed in a similar way. Less common is analytical 'age regression' hypnotherapy, during which a patient is encouraged to recall buried memories or emotions, which may be at the root of the present problem. This process may be traumatic unless carried out by a competent therapist. Initially the therapist will ask about the patient's physical and mental health, likes and dislikes and motivation to resolve any problem. When the patient is ready to enter the hypnotic trance, the therapist will make him/her relax by asking him/her to visualise a place or scene, or a counting method may be used. Depending on the problem, the therapist may proceed straight to implanting positive suggestions, or some analytic discussion may take place. Other therapies that induce relaxation and control of the mind and body include yoga, autogenic therapy and meditation. (See individual fact sheets). Therapies used in the treatment of ADHD and autism may also be beneficial to patients with TS. See our fact sheets on Auditory Integration Training, the Tomatis method, brushing therapy, Irlen lenses, Sunflower, Son Rise, Teacch, cranial osteopathy, Lovaas therapy, secretin and smart drugs. These are some of the references that have been passed to us; the list is not exhaustive. We have not necessarily read the books, and cannot say how easy it will be to get them. - A Ward Seligman, J.S. Hilkevich. Don't Think About Monkeys. Extraordinary Stories Written by People with Tourette Syndrome. ISBN: 1878267337.
www.counselling-directory.org.uk Counselling Directory is a comprehensive database of UK counsellors and psychotherapists, with information on their training and experience, fees and contact details.